The chilly nights of Canberra call for warm, cosy venues with warming drinks like red wine and whisky and, of course, music to jolt and warm the soul. Phia and Georgia Fields ticked all of these boxes, and while Smith’s Alternative was not the best fit for their music, they took it on with gusto and enormous smiles, and the small audience did the same. Melanie Horsnell kicked off the gig with some dark and broody tunes, her clever lyrics woven through sweet and sorrowful melodies. She was softly spoken but kept the dialogue going between songs. The story goes that she and Phia met in Europe in a ridesharing adventure, and made a promise to do some gigs together back on home soil. 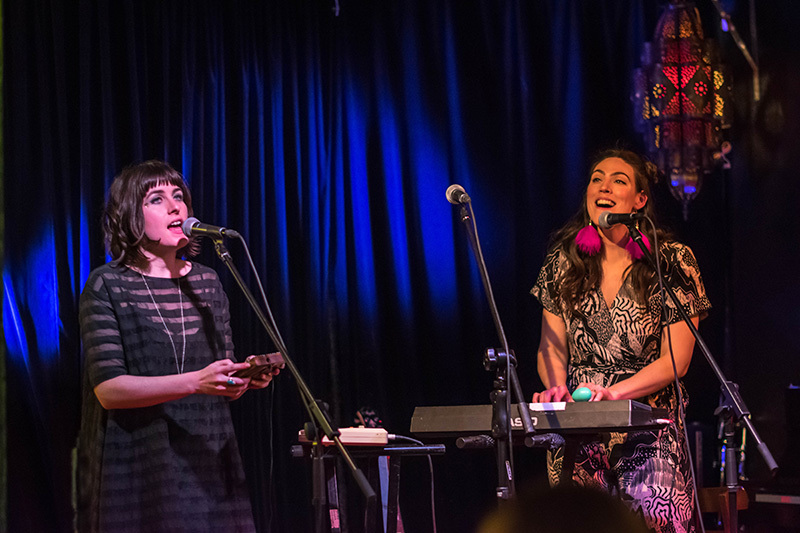 Phia and Georgia Fields also met in Europe and this tour was showcasing their collaborative sound, where they each added their distinctive sound to each other’s songs. It sounds complicated, given they are adding to existing material, but the result was unique, full of luscious layers of sound, harmonies and a journey in pop and folk with electronic twists. Their music is distinct largely because they both experiment with unusual instruments. Phia’s signature instrument is the African kalimba, a small wooden instrument with metal teeth which she had hooked up to a microphone. She made beats by tapping the wood and then looping them to create the rhythms in her songs. Classically trained, her voice is akin to Alice Russell’s or Lenka’s, and simply joyous to the ears. Georgia Fields created her quirky sounds with several instruments, including the omnichord, which is a cross between casio and autoharp. Highlights of the show included Field’s song ‘Open Orange (a dreamy song with lullaby sounds), Phia’s ‘Do You Ever’ (which was a pop-inspired song with catchy lyrics and beatboxing), and their fun finale, a cover of ‘Try Again’ by Aaliyah.